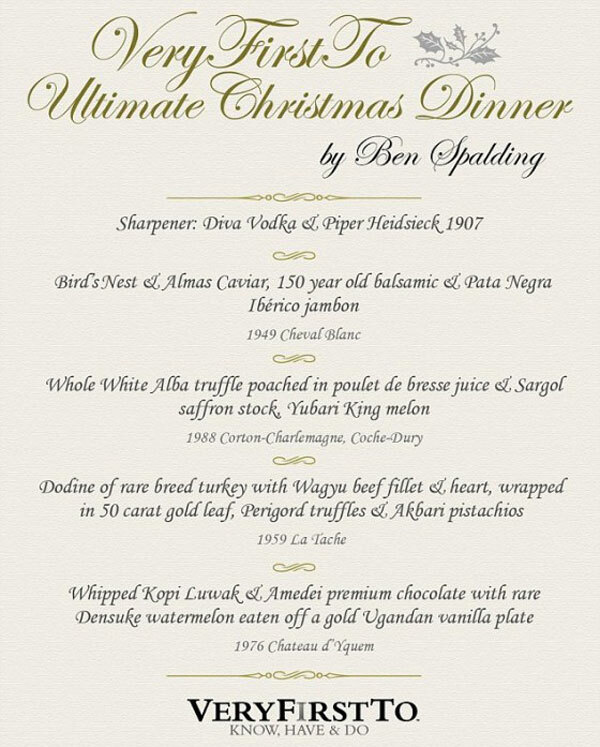 Although not recorded as Guinness World Record, this Christmas dinner menu, devised by chef Ben Spalding can be considered world’s most expensive. 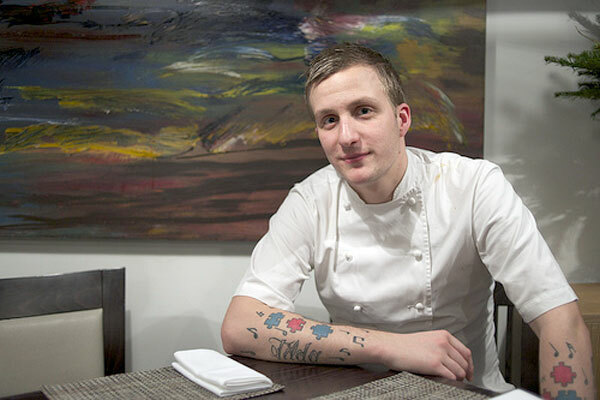 Ben Spalding is the 25-year-old head chef at John Salt restaurant, (formerly called Keston Lodge) in Islington, a neighbourhood in Greater London, England. He did his best to present his version of a traditional Christmas Dinner, that will cost whopping £125,000 ($200,860) for four, or £31,250 ($50,215) per person. The focal point of the £125,000 Christmas Dinner Menu will be the traditional Christmas turkey, served this time with Dodine turkey and with Wagyu beef fillet and heart, wrapped in £6,000 ($9,600) gold leaf and sprinkled with £5,000 ($8,000) Akbari pistachio nuts. Other expensive ingredients include a £37,000 ($59,500) bottle of Piper Heidsieck 1907 champagne will be served in diamond-studded flutes; a £2,000 ($3,200) stock of DIVA vodka, described as a “diamond-sand-filtered vodka” and served in a bottle that is filled with Swarovski crystals; a whole poached white truffle from Alba costing £3,500 ($5,600); 150-year-old balsamic vinegar costing £1,030 ($1,650), while for dessert gourmands will enjoy in beans of coffee berries excreted by the Asian Palm Civet cat and a Yubari King melon costing £2,500 ($4,000), in addition the the £2,600 ($4,180) Densuke watermelon. If you’re interested for this world’s most expensive Christmas dinner, you should order it from VeryFirstTo.com and young head chef Spalding (who has also worked with Gordon Ramsay and Heston Blumenthal) will spend Christmas Day cooking in your kitchen. He has also promised to donate 80% of his fee to charity. Using some of the finest ingredients on earth, this four course meal for four, is the ultimate culinary experience for the festive season.